Tesla’s own proprietary DC quick charging technology as found on its Model S, Model X and Model 3. the fastest electric car charging technology available to the public today is arguably one of the brand’s unique selling points. Supercharging technically capable of providing up to 145 kilowatts of power although usually maxed out at 120 kilowatts in most cases. Tesla’s superchargers can replenish a compatible Tesla battery pack as a rate of just over 330 miles/h which is about 540 km/h far faster than the 50 kilowatts currently used by both CHAdeMO and CCS quick charge standards. In recent months Tesla has been working hard to discourage supercharger use for all but long-distance travel promoting destination charging and home-based charging as a more sensible solution for the vast majority of Tesla customers. In this case the reduction in supercharger speed for Tesla cars with a high supercharger use isn’t a punishment. it’s a way to protect the batteries and thus ensure the car continues to operate properly for many more years to come. Tesla gave customers with supercharger enabled cars unrestricted access to its supercharger network regardless of how many miles they drove or how old their car was. but last year that policy switched to only providing 400 kilowatt hours of free power per year for those buying brand-new Tesla. Tesla then offering customers the chance to buy additional supercharger credits as and when needed, that policy change caused quite a ruckus among Tesla fans but over the weekend another supercharger story surfaced which suggests that some owners especially those who use the supercharger network a lot but experiencing maximum charge rates during their cars supercharger sessions that were far lower than the superchargers theoretical maximum power. Every Tesla features an advanced battery management system that does everything it can to ensure the individual cells in each battery pack are kept in the best possible health to ensure high performance and longevity over many years of use just like any other electric car battery pack. The lithium-ion cells found in Tesla electric car slowly and inexorably aged with time, this aging process not only affects how much electricity each cell can store. The amount of instantaneous power an electric car can safely provide or receive especially ones with adequate thermal management like Tesla’s are designed to safely charge and discharge at high rates with a minimal effect on the battery pack continued extreme charging and discharging does induce premature battery packaging. Tesla just like every other automaker is well aware of this limitation rather than allow supercharger use cars to continue to charge at ultra high rates thus leading to premature battery death. Tesla’s engineers opted to add a subroutine which gradually limits the maximum supercharger power the car can use. this routine does gradually lengthen the time it takes to charge the supercharger station. It does in order to protect the battery pack and ensure continued battery pack health for high supercharger cars. Now lets talk about a use case outside normal electric vehicle ownership, most plug-in car drivers charge at home overnight visiting a rapid charging station like a CCS, CHAdeMO or Tesla supercharger when making the occasional long distance trip which is all well within the limits that most manufacturers plan for. It’s only when cars go through multiple rapid charging cycles gain and again that the risk of damaging the battery pack increases if charged currents are kept high. Tesla said that they currently restricted supercharging maximum power due to age, mileage or number of supercharger sessions. 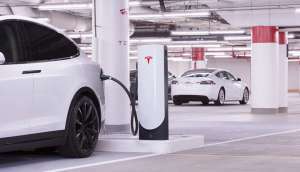 Most Tesla customers understand why the supercharger limit exists but some are vocally upset about it especially in the light of Tesla’s recent patent applications pertaining to liquid cooling while charging as well as high high power supercharging that could even double or triple today’s supercharger speed. Lithium-ion cell has a limit on the number of times it can be charged at high voltage and high power before premature aging kicks in. In five or ten years time will likely look back and laugh at how slow today’s modern charging technology is by comparison to conclude it’s only an extra five minutes or so per charge so ask yourself this would you rather have a car that takes a little longer to charge or one with the battery pack that’s degraded to the point where you can’t drive it very far anymore. Next articleTesla Model X vs Jaguar I-PACE Comparison: Which is Better?